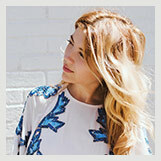 I wanted to acknowledge Free People this month on the blog; because in addition to being one of my favorite places to shop (I really identify with the free-spirited, boho-luxe aesthetic, and they always have lots of animal-friendly options to choose from), they just collaborated with PETA for a vegan fashion look book. Whether you love or hate PETA… If you’re an animal or an animal lover, this is a good thing; so I for one want to support and honor it! For reference, go a size up in the jeans! Booties and tee are true to size. Sidenote: while I was shooting this, I got stopped by two women saying they loved my outfit. I swear, guys– monochrome with a metallic accent is an easy-peasy way to look like you have your act together!